Thomas Pratt is a fisheries ecologist from Sault Ste. Marie, Ontario. His work with the Department of Fisheries and Oceans involves putting tracking devices in fish, and following their movements. These movements reveal previously unknown behaviours, habitats and migratory corridors for species of conservation and management concern. During ship movements through the St. Lawrence basin he will attempt to detect fishes that have been fitted with transmitters. 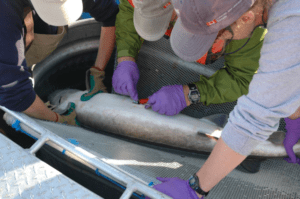 With a better understanding of fish movements and their important habitats, conservation biologists and policy makers are able to create useful management strategies.